Not really going to do much of a recap in this game because it was all a bit boring and nothing much happe... ZOMG!!! MIKE FIERS NO HIT THE DODGERS!! HOW FRIKKING AWESOME!!! So, one day after Chris Archer brought no-no stuff to the Minute Maid mound - and Archer was absolutely amazing - a considerably less heralded starter allowed only three baserunners on his way to a no hitter - the first in the history of the Juice Box. Mike Fiers is perhaps the least likely of the six starting pitchers slated to start in this series to fire a no-no, but he pulled off a gem tonight, walking three and striking out ten in the process. He got into a serious groove around the sixth inning, and piled up the strikeouts late. The game ended on his 134th pitch - he won't go on normal rest for his next start - with a fastball outside to Justin Turner that he swung through, and the crowd when nuts. I noted earlier that it is the first Astros no-no since the six-pitcher no-hitter at old Yankee Stadium in 2003, and the first individual no-hitter for the franchise for 22 years. Anyhow, Fiers' feat overshadowed other significant parts of the game. The Astros have scored three runs in their last three wins including tonight, which says something about their recent pitching. Handsome Jake had a great night of his own. And the Astros had more than 20k paying patrons in attendance... but many of them were Dodgers fans. Mike Fiers was awesome. He walked one in each of the first three frames, but he bounced back to retire the last 21 in a row. 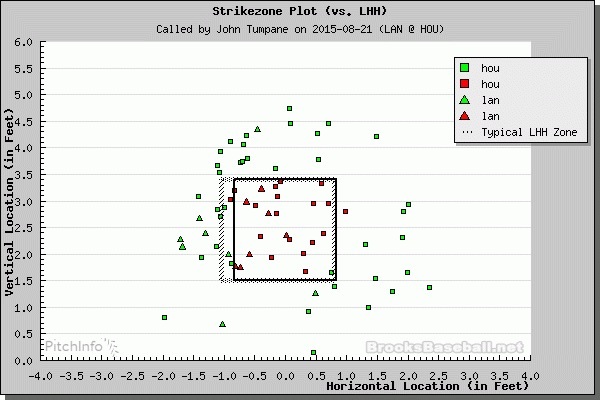 The no-hitter was remarkable for lots of strikes (both swinging and looking) and lots of weak contact. Not many balls were hit hard and fair. No magnificent defensive plays were made. Fiers earned this one, mostly by virtue of his stuff. The first inning was relatively innocuous, with Jimmy Rollins popping out to Jed Lowrie at third (although positioned at a traditional shortstop), Chase Utley grounding down the first base line, Justin Turner walking on a 3-2 pitch inside, and Adrian Gonzalez flying out to RF. After a lead-off walk to Andre Ethier (who has had some success against Fiers, with a couple of extra-base hits logged in his account), Fiers set down the next three on a strikeout looking (curveball away to the lefty), a fielder's choice to second, and a foul out near the camera-well down the first base line. Another lead off walk in the third represented the last Dodger's baserunner of the night - a Rollins pop out to second, a fielder's choice, and a line out up the middle to a shifted Altuve closed out a scoreless third. In the fourth, Adrian Gonzalez was victimised by a fading change up inside for a called strike three (the ball broke back over the plate), with the other two outs recorded on groundouts. In the fifth, Joc Pederson went down swinging for the third out after two pop ups - he struck out on a fastball down the pipe. Leading off the sixth, Jimmy Rollins went down on a curveball away for a called third strike before the next two hitters grounded out. The seventh inning was when Fiers took it up a notch. After an Adrian Gonzalez ground-out on a curveball leading off, Andre Ether went down on an elevated fastball inside, and Yasmani Grandal struck out on a running fastball away. Fiers sat at 107 pitches after the Grandal strikeout, but it was clear that he was going to be given an opportunity to finish the game. Things were getting tense in the eighth - at least in my living room. A.J. Hinch substituted Chris Carter for Marwin González at first base, but it didn't matter because Fiers struck out the side. Carl Crawford went down hacking on three pitches, the last of which was a curveball in the dirt. Kiké Hernández struck out looking on a curveball that froze him. Joc Pederson went down looking on a fastball on the black inside. One of the very entertaining aspects of watching the game was listening to Bill Brown tiptoe around the words "no hitter". He frequently eluded to "something special". At one point, he talked about how there were seven hits in the game, and all of them were by the Astros. Another time, he talked about a line of zeros for the Dodgers. One really good thing about being an Astros fan is that the presentation of the game by both the radio and TV crews is pretty solid. Brown did a really good job of skilfully eluding to the task at hand, without ever saying "no hitter". And it isn't like he gets a lot of practise doing that, calling games for the Astros and all. Anyhow, on to the ninth. Jimmy Rollins hit the hardest hit fair ball of the night - Justin Turner had previously mashed a long fly ball with serious home run distance foul down the left field line in the sixth inning. On Rollins' fly out, Marisnick retreated, and had time to pull up a couple of steps short of the wall just short of the Astros bullpen to take a comfortable catch. Hearts were in mouths for a second or two, however. The second out of the frame was Utley's - he hit a much lazier fly-ball to relatively deep RF, but still well short of the warning track. Justin Turner was the last out - and this is covered in detail below. Must C will be placed here once on MLB.com - please watch it if you haven't already. It is cool! Screw you, Mark Saxon from ESPN. Next time you want to imply that a pitcher that got 27 outs without giving up a single hit had help from the home plate ump, please take a minute a look at the strike zone plots. If there was generosity, it was the LA pitchers that benefitted. I guess, in your defence, you never specified which team benefitted from the generous calls, but that strike zone plot looks pretty darn sharp to me, and not at all "generous". Mike Fiers threw a no hitter which he deserved against the most expensive team in history. That is a fact. Fiers is clearly the story of the night, but some good moments were recorded at the plate as well. Jose Altuve singled through the 5.5 hole to open the first, then a Carlos Gómez hit the other way sent him to second. But Correa hit is hard up the middle, and the result was a double-play grounder to a shifted Kiké Hernández. A Jed Lowrie grounder back to the hill ended the frame. The second what where the Astros scored a couple of vital runs. Gattis and Rasmus were retired without too much problem, then Chris Carter singled on a line drive 2-2 breaking pitch that caught too much of the zone. The line drive was a single over the head of the third baseman - a solid base hit that dropped well short of the left fielder. The next batter was Handsome Jake Marisnick, and he took a similar 1-0 pitch and hammered it into the LF-CF power alley, off the signs below the railroad tracks and to the CF side of the Crawford Boxes for a no doubt shot. Marisnick has looked a little better over the last few weeks, and this shot was a further sign of that. The home run was estimated at 421 feet. The Astros threatened to make more noise that inning, because the next batter (Jason Castro) hit a line drive the other way, into the LF corner for a double. A Jose Altuve line drive up the middle was right at a shifted Hernández, so that set the side down. The Astros went in order in the fourth and fifth. The sixth was remarkable for Handsome Jake's lead off double - he mashed another fly ball that bisected the Dodger LF and CF duo, and bounced just short of the bullpen wall. Marisnick looked like he may try for third, but he pulled up with a stand-up double instead. He immediately stole third on the first pitch of the Castro at-bat (a breaking ball), so he was at third with no outs. Certain run, right?? Not on the 2015 Astros, who are exasperating when it comes to the basics sometimes. This is a prime example - against a solid starting pitcher, the first time through the order, they string a line drive and a fly ball together with two outs, and take a 2-0 lead. But ask three hitters to get a runner in from third with no outs, and the response that you might get would be mixed at best. Castro flew out to medium right - Marisnick bluffed to head home, but didn't dare to try, but he would have been safe because Andre Ethier's throw was well to the first-base side of the plate. Altuve and Gómez both struck out, and Marisnick may as well have had a deckchair and a drink with a miniature umbrella in it while watching from third base. Altuve has not been consistently sharp this year - I know that will be unpopular sentiment - and if you are looking at a place to play Marwin González, then second base would not be the worst option at the moment. Anyhow, the sixth was remarkable for the missile that Evan Gattis stuck into the Crawford Boxes. The pitch was an elevated changeup on the black away on a 3-1 count, and Gattis turned on it and got enough barrel to mash it 10 rows deep. The ball was hit fairly flat and hard, and hopefully this is a sign that Gattis is heating up some. That was the last hit for the Astros - they went down in order in the seventh and eighth against Chris Hatcher and Yimi García respectively. But by this time, the Astros hitters were not the focus of the game, and in some ways it was probably better that they were retired in relatively short order because it gave Mike Fiers little opportunity to think about what he was about to do. In terms of the box score, Handsome Jake was the standout performer, with a 2-3, HR, 2B night. Gattis went 1-3 with a homer, Castro went 1-3 with a double, and Carter went 1-3. Altuve and Gómez both went 1-4, with both hits singles in the first inning. Mike Fiers had Justin Turner at 2-2 in the ninth. The stadium was on it's feet, and the crowd noise had been slowly building when the Dodgers were at-bat for the last few frames. Fiers went with a fastball away that was in the top third of the strike zone (but was probably off the plate). Turner was late swinging through it, and Fiers celebrated by throwing his glove miles in the air. Castro and Fiers celebrated briefly together as a battery before they were swamped by the rest of their teammates. A special moment in Astros' history, and in the professional career of both Fiers and Castro. I am not even going to bother. If you have read down this far, and can't take a guess, then shame on you. No Goat... not on a night like this. The home stadium ceremony celebrating Craig Biggio's induction into the Hall of Fame will occur an hour prior to the game. Congrats to the entire Biggio family, and to the Astros organisation. thank you for your description of this game! No comments on the "Growing Controversy" suggesting Fiers had pine tar on his glove?